DC has released their previews for books shipping in February 2006. 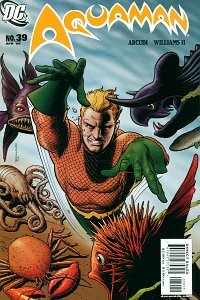 Aquaman #39 will be shipping Feb 1st and is written by John Arcudi with art by Leonard Kirk & Andy Clarke. The cover is by Brian Bolland. Complete solicits are available at DC Comics, and also on a single page at Newsarama and Comic Book Resources.